Windows Live Mail has bee discontinued by Microsoft and it is no longer available for download. If you try to run your existing Windows Live Mail client then it will keep crashing. Microsoft has retired it finally and now you have to move on to some other email clients. If you are looking for a free email client for Windows 7 or Windows 10 then you can try Mozilla Thunderbird. Mozilla Thunderbird is a free email client with all the necessary features that you'll require in a Windows mail client. Mozilla Thunderbird also supports Add-ons or extensions which bring several impossible works to reality. One such task is to restore the Windows Live Mail backup on Mozilla Thunderbird. This task seems impossible because there is no direct way to import Windows Live (.eml) messages to Mozilla Thunderbird. EML is the file format of the email messages exported as a backup by the Windows Live Mail. Make sure you have the backup of your old Windows Live Mail messages. I can't show you how to take a backup as eml because the client is no longer working. If you are currently running Windows Live Mail then try to export your messages from Windows Mail in .eml format. Now save the backup to your desktop and download and install Mozilla Thunderbird from this link. Open it and click the hamburger menu in the top right corner. Here go to 'Options>Account Settings'. 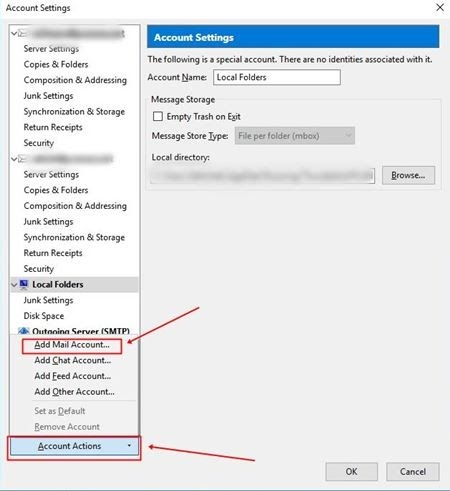 Now click 'Account Actions' and then click 'Add Mail Account'. A dialog box will open asking you to enter the username and password of your email. Enter the details and follow the instructions to add the mailbox to Mozilla Thunderbird. Now after setting up the mailbox download the ImportExportTools from this link. Now open Mozilla Thunderbird and click the hamburger menu in the top right corner and then select 'Add-ons'. In the 'Add-ons Manager' click the 'Extension' tab on the left side. Now click the gear/settings icon just before the search button and click 'Install Add-on From File'. Pick the ImportExportTools add-on from where you saved it to install. After installing the add-on restart the program. Now we are ready and it's up to you where you want to import the eml messages to local folders or the original mail account. Currently, I am importing the Windows Live Mail eml messages to local folders in Thunderbird. 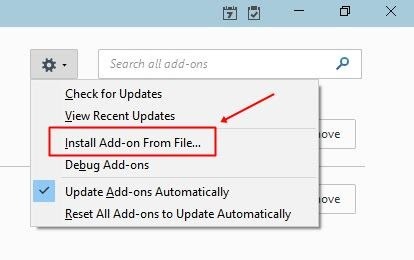 To import right click on 'Local Folders' and select 'New Folder'. Create a new folder for convenience and import the eml messages to this folder. Right click on this newly created folder and open the submenu of 'ImportExportTools'. Click 'Import all messages from a directory' and then select 'also from its subdirectories'. Locate the Windows Live Mail backup folder and open it. Your all eml messages will be imported to Mozilla Thunderbird in this new folder. Note: The ImportExportTools has a problem importing very large eml backups. It doesn't work with multiple subdirectories. So if you have a large eml messages backup then this will not work. In this case you have to manually import each subdirectory which is nothing but just a collection of folders and Windows Live messages in eml format. So, this manual importing process will be time consuming but is definitely worth spending time. Because you can see all the emails in one place. So this is how we can import Windows Live Mail messages to Mozilla Thunderbird using a third party add-on. If you liked the article then do take two minutes to share it.